Standardize & boost the impact of your signatures. With Liqui-Site’s eSignit platform, this is a realistic aspiration in most cases. 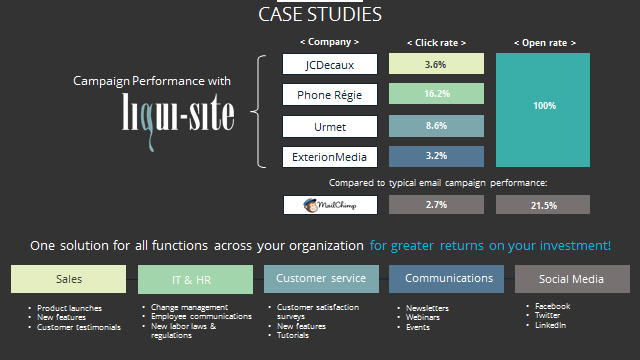 Roll out dynamie, controlled, and targeted communication campaigns from within your email! Inside your organization you can boost motivation and engagement; emails reaching recipients outside your organization will receive customized targeted communications. Create personalized signatures for specific groups of employees using an HTML editor. Insert and schedule special signatures for use inside or outside your organization on specific dates. Track the number of clicks and find out who clicked from a dedicated analytics dashboard. Ensure a brand identity by standardizing 100% of your signatures. Leverage your marketing databases and increase your return on investment. Since your campaign reaches every person you email you can expect your campaign to be seen 100% of the time with a click through rate higher than standard email campaigns! Want to learn more about eSignit for your organization? Download our deck here. Elevate your style, streamline your processes, extend your reach. We'll be happy to listen, answer any questions, provide guidance and recommendations to ensure the very best outcome for your needs. Please fill out the form below to start the conversation.